Volunteering with The Salvation Army is a rewarding experience and you help us fulfill our promise to America of "Doing the Most Good." Thanks to our selfless supporters, we touched the lives of 71,665 people with 398,172 services in 2016. When disaster strikes you can count on The Salvation Army to be on the scene. To volunteer, contact Scott Robishaw at 330-434-7365. Give now to our Online Red Kettle because need knows no season. You can give 24 hours a day, 7 days a week, 365 days a year. The Salvation Army of Summit County is committed to help people break the cycle of poverty. Learn more in the above video. 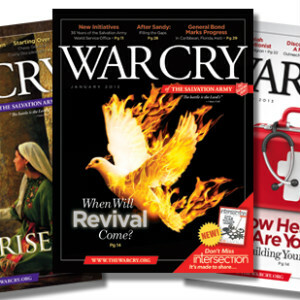 Each issue of The War Cry, The Salvation Army's national magazine, contains stories about transformed lives and articles that inspire, instruct and encourage readers to grow.